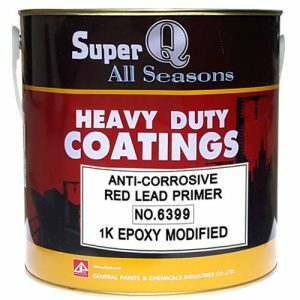 .RED LEAD PRIMER 6303 is made from 1 K modified alkyd resin pigments with red lead . It has good adhesion and quick drying properties. High durable coating that requires low maintenance characteristics. As a thin-film pretreatment primer for machine, equipments, steel building components, chemical industry, construction and steel work surfaces to promote adhesion for subsequent. Store in cool and dry space, isolate from source of heat. 1 year in cool place. Keep in cool and dry places. Avoid breathing vapour. Old paint coating must be perfectly removed, then clean by sand paper, hand brush or sand spraying. After preparation of metal surface, the primer should be applying immediately to avoid re-corrosion.